Have you heard of gnudi? I hadn’t until I stumbled across a recipe for them in the Wall Street Journal last year. Gnudi, as you might guess by the name, means “naked” in Italian. These ricotta dumplings are lighter than gnocchi, which are made with potato, and require far less prep. They are also the perfect accompaniment to the roasted garlic tomato sauce that I posted last week. An official definition of gnudi is hard to find. I consulted several food dictionaries and some tomes of Italian cooking only to find these pillowy dumplings weren’t even mentioned. A quick google search yields contradictory definitions. Some folks place gnudi squarely in the gnocchi camp, while others argue it is similar to ravioli, but without the pasta – hence “naked.” No one argues its deliciousness. 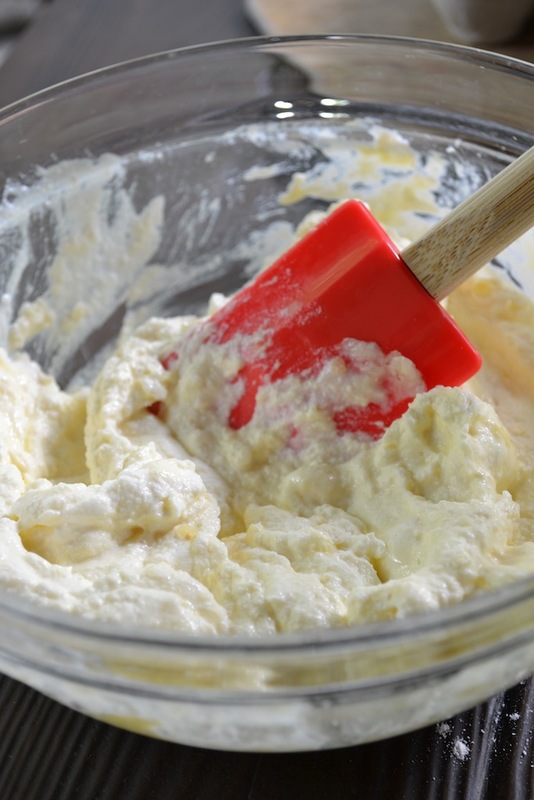 The dough primarily consists of fresh ricotta cheese and flour. It’s extremely moist and soft which contributes to its fluffy texture. The dough is a bit challenging to work with which is why I generously dusted my board, the dough, and my hands before rolling out the long ropes of dough. Once you master this however, it is smooth sailing. You use a serrated knife to cut the dough into 1-inch chunks and then the gnudi are gently placed in a large pan of simmering, salted water until they float to the surface – about 4 minutes. 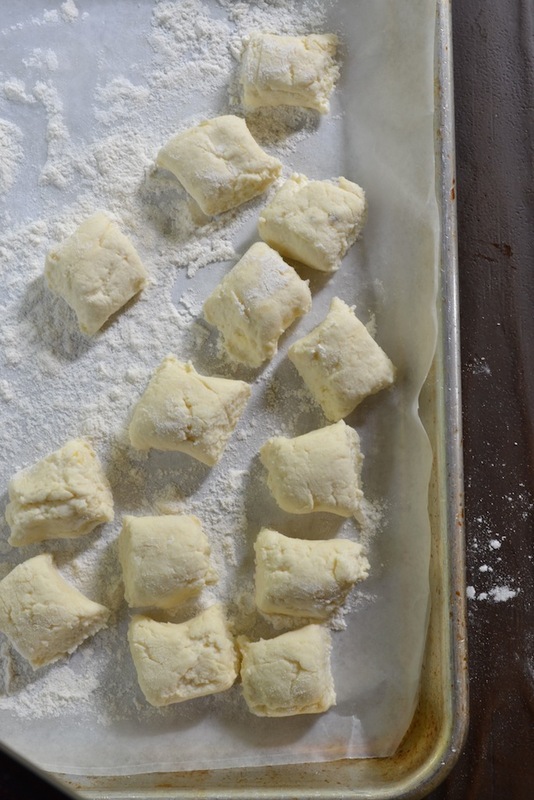 If making the dumplings ahead of time, simply place the uncooked gnudi on a wax paper-lined baking sheet that’s been generously dusted with flour. Refrigerate until ready to cook. When cooking the gnudi, have your chosen sauce simmering in a large saucepan or high-sided skillet next to the pan you are using for the gnudi. Use a slotted spoon to pull cooked gnudi out of the simmering water and gently nestle them in the pan with the sauce. If you don’t have enough sauce to adequately coat all the gnudi, simply add a little of the cooking water from the gnudi to extend your sauce. Enjoy with grated parmesan cheese. Happy cooking! If you are hungry or tend to lose control around ridiculously good dumplings, this recipe may only serve 2. One pint of roasted garlic tomato sauce (posted on Minced blog on August 13, 2013) is the perfect portion for this amount of gnudi. A pint of your favorite tomato sauce would also be delicious. If pulling out all the stops, mince some fresh herbs and add them to the gnudi dough at the same time as the flour. In a large bowl, whisk together the ricotta, Parmesan, egg, melted butter, and nutmeg until combined. 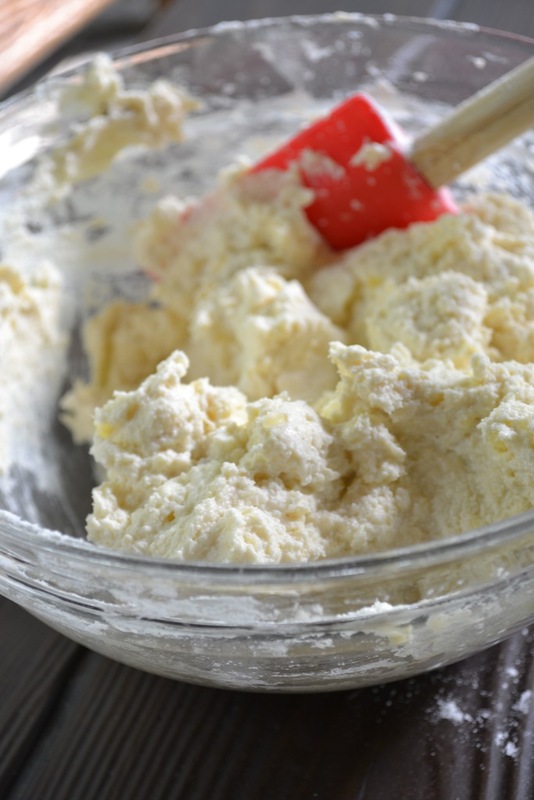 Use a rubber spatula to stir in the flour until just incorporated and season the dough to taste with salt and pepper. Don’t overwork the dough; the dough will appear moist and shaggy. Generously dust the work surface and your hands. Divide the gnudi dough into four portions and generously dust the dough with flour so that it doesn’t stick to your hands while working with it. 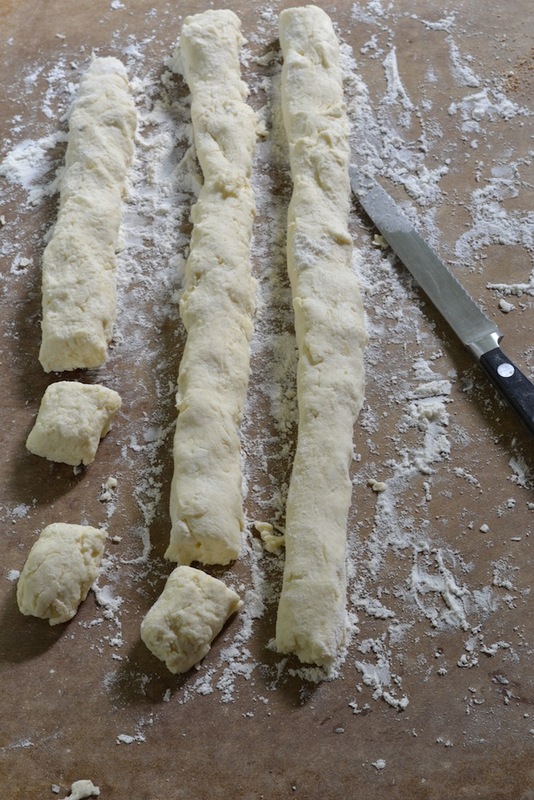 Roll the dough, using your hands, into 4 long ropes about 1-inch thick. Use a serrated knife to cut the ropes into 1-inch pieces. If serving immediately, bring a large pan of generously salted water to a strong simmer. Add the gnudi in batches to the skillet. The gnudi will float to the surface when cooked through and this typically takes about 4 minutes. Remove the cooked gnudi with a slotted spoon and gently place them in a pan of simmering tomato sauce. Repeat with the remaining gnudi. Gently stir to combine and add some of the gnudi cooking water if you need to extend the sauce. Serve with additional Parmesan cheese. 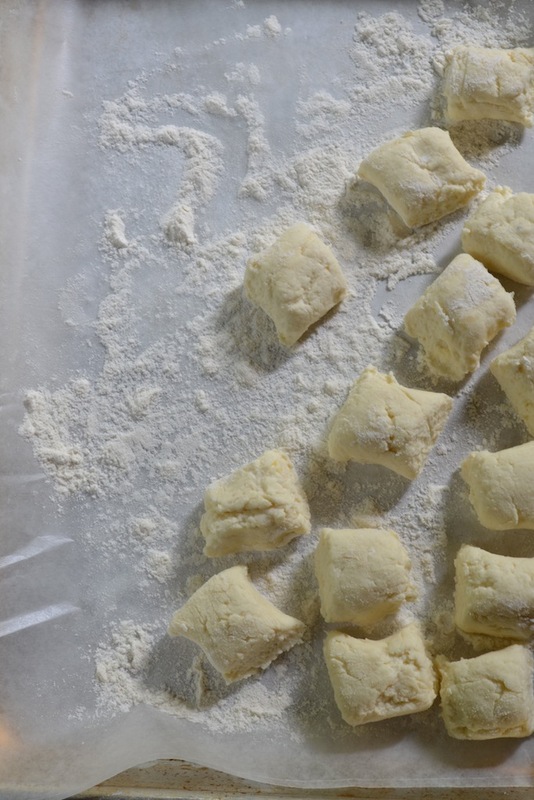 If making ahead, place the cut gnudi on a wax paper-lined baking sheet that has been generously dusted with flour. Cover and refrigerate until ready to cook. Cooking time may be a minute longer due to the gnudi being cold. i have been wanting to try gnudi! i have a recipe in a pasta-making book but had never known anyone else who ever made them. this has inspired me to get back into “italian mode” soon! they look wonderful! Thanks, Jess! Definitely give them a try. I adore gnocchi, but I think these might be even better. They are so light and fluffy and they take such little time to make. I make my gnocchi with ricotta instead of potato. I never knew it was called gnudi. Thanks for the info and recipe. I’ll try it! My family loves gnocchi (gnudi). Thanks!